Contrary to “airpocalypse” prone cities like Beijing or Harbin, Dalian generally enjoys fresh air blown in straight from the sea. With its beautiful scenery, relaxed pace of life and seaside location, Dalian is considered one of the most romantic cities in China. But where to go to start your exploration of this splendid city? Ask any local and they will tell you “Binhai Road” (滨海路). Binhai Road’s claim to fame is its rare blend of mountains and sea, and its 20.99 km long wooden boardwalk; the longest in China. Before it was opened up for tourism, the trail was used for military purposes. Starting at Xinghai Bay Bridge and ending at Haizhiyun Park, 11 observation platforms are strewn along this scenic trail. In addition to the boardwalk, Binhai Road stretches on for a total of 40 km and features 12 tourist attractions including Xinghai Park, Xinghai Square, Haizhiyun Park, Bangchui Beach, Bird Nest Ridge scenic area and many more. However, seeing all 12 attractions and exploring the entire length of the road is impossible on foot in one day. Instead, do what most people do and take one of the popular routes below. 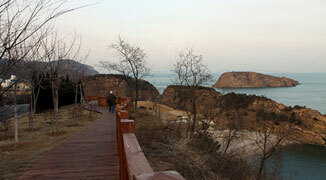 If you only have a short amount of time to spend in Dalian, it’s best to just focus on one of the parts. To explore all four will take a couple of days but is also well worth it. This is the most scenic route along the Binhai Road tourist trail. The 10 km stretch takes approximately three hours to complete. Definitely spend a bit of time at Bird Nest Ridge (燕窝岭) to take in the natural scenery. Beida Bridge, also known as “lover’s bridge”, is a 30 minute walk away. The suspended bridge which symbolizes the friendship of Dalian and Jiuzhou in Japan offers stunning views of the coastline. From there, carry on to Fujia Village - known for its nearby bathing beach. But before you throw yourself at the mercy of the waves, be warned: in 2011 a nearby petrochemical plant was suspected of leaking toxic chemicals into the water. Call it a hunch, but you may want to give swimming here a miss! Moving on, about 3 km away, you’ll hit upon Xinghai Square, the largest square in the world. The area surrounding Xinghai Square is also great for refueling after a long days walk as there are many restaurants and bars in the vicinity. Start by taking the No. 703 bus to Shanping Street (the last stop) and then walk eastwards for a few minutes to get to Yingbin Road. Yingbin Road is a beautiful stretch where you’ll find Haizhiyun Park and Bangchui Island Scenic Area. Entrance to Haizhiyun Park is free but it’s advised to get here early as it tends to attract a lot of visitors. Bangchui Island Scenic Area is a beautiful expanse of nature which is home to 18 different types of tree and a whole plethora of other vegetation. Take in the breezy sea air and navigate yourself past the 50 sculptures dotted throughout the area. The entrance fee here is 25 RMB but the area is so big that you’ll soon feel like you have the place to yourself. Once you’re done absorbing the scenery at Haizhiyun Park and Bangchui Island, and you still have time, move on in the direction of Shicao Village and Yuren Pier. This stretch is 7 km long and offers stunning vistas of the coast. From Yuren Pier take the No. 2 or 712 bus back to the city center or even hail a cab; neither option is expensive. Wow, that is indeed a very big and embarrassing mistake. We're fixing it right now. Thanks.